There was a SW Ecodistrict public meeting Tuesday night hosted by NCPC that discussed some options that are being contemplated for 10th Street, Banneker Park, and stormwater management throughout the ecodistrict. The Southwest Ecodistrict Initiative is comprehensive plan to create a sustainable mixed-use community in a 110-acre area south of the National Mall, which currently includes a significant amount of federal office space. The slides from the meeting are available here. In the interim, there are plans to activate portions of 10th Street with programming. The street has a 150’ right-of-way and at some places, the distance from building to building is 230’. It was suggested that some street festivals that currently take place on Pennsylvania Avenue, NW could be accommodated on 10th Street from Independence to Maryland avenues. Perhaps the Southwest BID in the works could help bring some of that programming to 10th Street. Other ways to improve the street in the interim include furnishings, street painting, lighting, and wayfinding signage. In the long-term, it’s recommended that the right-of-way remain at 150’, but the median along 10th Street should be widened from 39’ to 52’ and the sidewalk and vehicle lanes be narrowed to accommodate a five-foot bike lane on both sides of the street. Different alternatives are available to allow trees of varying height to grow on 10th Street, which is built mostly on a bridge structure. 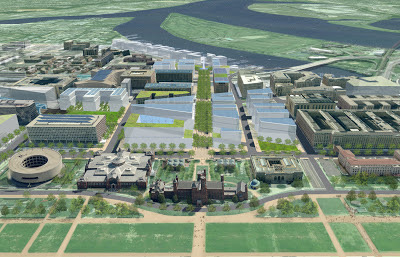 In addition, there are three programmatic alternatives for the street – one emphasizes on hardscape (which would allow more flexibility for programming in the median); the second emphasizes on softscape (continuing the feel of the National Mall); and the third emphasizes on water (10th Street used to have water elements). Questions remain about whether the character of 10th Street should be more like a park, a street, linear, episodic, or formal in nature. A phased approach to improving the streetscape on 10th Street is preferred, since there is currently no financing dedicated to make improvements. Perhaps some of the funding can be obtained as a result of private development adjacent to the street, such as JBG’s plans for L’Enfant Plaza, or the GSA’s planned redevelopment of the area closest to Independence Avenue called Federal Triangle South. While there is currently no financing available for streetscape improvements along 10th Street, the developers of The Wharf will finance the construction of a temporary staircase connecting Maine Avenue with Banneker Park to facilitate access from the National Mall and L’Enfant Plaza Metro. Due to the grade change, the stairs can be straight, include switchbacks, or a combination of both. Design of the stair could be monumental, contemporary, natural, or have “District” features found in other areas of the city. Even though the amount of development in the SW Ecodistrict will increase to 15 million SF of space compared to about 10 million SF now, the amount of water usage is anticipated to decline. The design of the SW Ecodistrict will allow more stormwater to be captured on site and recycled instead of being sent untreated to the Washington Channel and the Anacostia River. Large cisterns can be built beneath 10th Street and other areas to help store water. Green roofs, flow through swales, and trees can help reduce runoff. In the summer, condensation from air conditioner coils can be collected to create potable water. Capturing and treating stormwater and grey water can be used for non-potable uses such as washing & irrigation while rain and well water can help satisfy potable water demand. Comments are being accepted on the SW Ecodistrict website until June 21. What are "district features" for a stairway?